One man is as the center of a story you can’t avoid in the media, since last Friday. General David Petraeus, architect of the U.S. “surge” in Iraq, pulled in to “save” Afghanistan, then bumped over to the CIA last year, was forced to resign because the FBI, we are told, found out about an affair he was having with a fawning biographer. The other story is one you could barely find until days ago, despite the subject being a soldier who allegedly killed 16, including nine Afghan children, on March 11 last year near Kandahar. 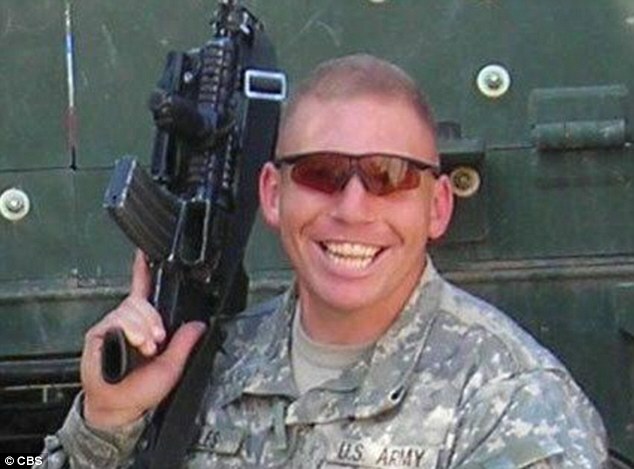 Robert Bales, an Army Staff Sargent, is said by the Army to have gone on a rampage in two villages, and is facing a court martial involving the death penalty. Those in charge of U.S. national security are reeling, though you can hardly find a word of criticism for General Petraeus, save his admitted “indiscretion.” He’s said to be a national hero, and somehow even more of one, since he “sacrificed” his career and resigned. David Petraeus ran two illegitimate, unjust occupations, the whole Central Command, and now the CIA. Adultery is surely the least of his crimes. The actions of both of these men represent the real face of the U.S. occupation of Afghanistan, and they need to be thoroughly investigated, with the aim of keeping criminals like this away from people they could kill. Ten years ago today, lawyers for the Bush Regime sent memos up the chain of command which quickly reached the military and the CIA. 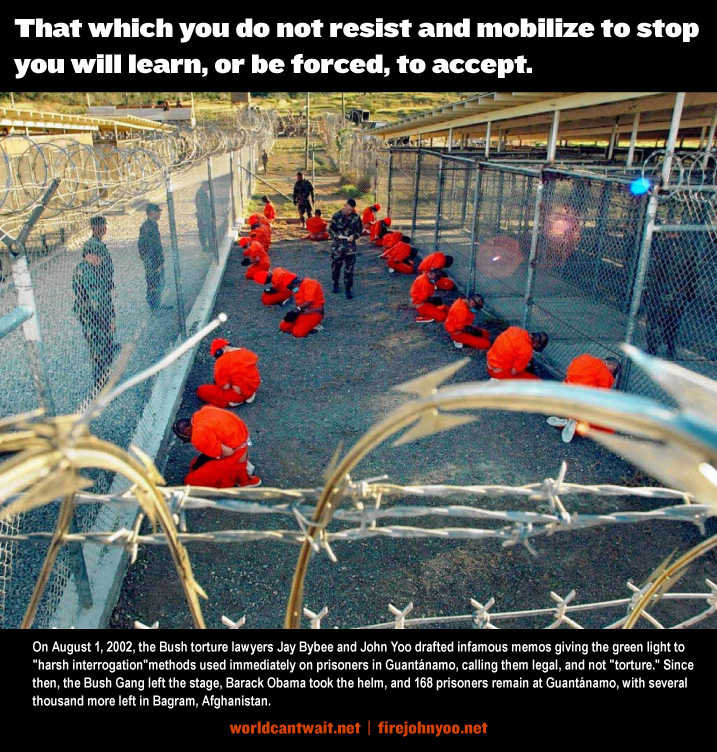 The August 1, 2002 “torture memos” authored by attorneys in the Office of Legal Council at the White House gave the green light to torture, calling it “harsh interrogation” and completely legal. The clock is ticking. August 1st marks the 10th anniversary of the adoption of professor John Yoo’s “Torture Memos,” which sanctioned mental and physical torment and coercion practiced by the state. It’s been 9 years since those same documents were found legally defective and withdrawn. The Bush Gang left the stage, Barack Obama took the helm, and 168 prisoners remain at Guantanamo. These men must not be forgotten, or their stories conveniently swept under the rug for the remainder of this election season. Over the summer of 2002, when we knew we had to do something different to get information out of Abu Zubaydah, who had been captured a few months earlier, we worked with our lawyers to make sure that we came up with techniques that were within the law. These techniques were vetted with the Department of Justice and the White House—with the policy people and the leadership people at the White House. Then, on August 1, 2002, we received a binding legal opinion in writing from the Justice Department that said waterboarding and nine other techniques we wanted to implement were not torture. We then went to the White House and asked the N.S.C. to give us policy approval to proceed, and for the President to direct us to proceed. And they did. A month later, when the Congress came back to town, we briefed the leadership of the House and Senate committees on intelligence, both Democrats and Republicans. They had no objection. And none of the torture team partners has suffered indictment, or even deeply serious investigation by the Obama administration. I have to add a thanks to Women Against Military Madness in Minneapolis, who are outside the Federal Building in Minneapolis today in an action called Tackling Torture at the Top. My donation to World Can’t Wait today will help send an orange-jumpsuited contingent to the Democratic National Convention to represent the victims of brutal prison policy, and all of us who say NO to torture. Drones and Guantanamo, owned and operated in a bi-partisan fashion. But it’s the Democrat War party who got people at accept them as “normal” and even legitimate. AUTHOR: Jay Bybee, Assistant Attorney General, Office of Legal Counsel In what has become notorious as the “torture memo,” Jay Bybee signs off on an opinion authored by John Yoo. The memorandum systematically dismisses numerous U.S. federal laws, treaties and international law prohibiting the use of torture, essentially defining the term out of existence. AUTHOR: John Yoo, Deputy Assistant Attorney General, Office of Legal Counsel John Yoo writes to White House Counsel Alberto Gonzales warning of potential threats of international prosecution regarding the administration’s interrogation policies. Yoo notes that “Interrogations of al Qaeda members … cannot constitute a war crime” because of the Presidential determination that Geneva’s protections do not apply.